Following on from a missive on tangles and disappointment, for my second post about cables, I’m going to talk about permanent installations. Unsurprisingly, here at MetaBroadcast we need a lot of cables for both data and broadcast signals. 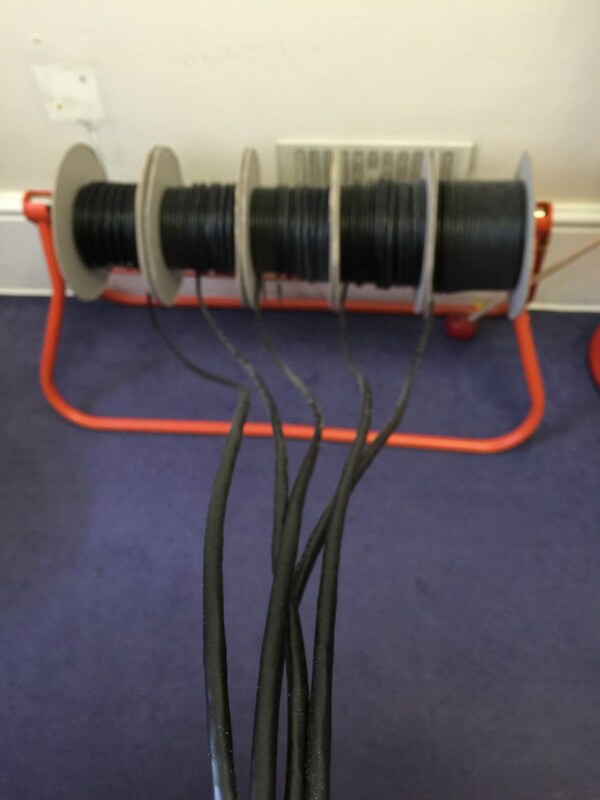 Over the last few years we’ve slowly filled our offices with large amounts of this cable, so that we can accommodate both normal office needs, and also test a variety of broadcast equipment. We’ve learned quite a bit about how to do this. As Mirona wrote recently, our HQ is kinda like a house. We wanted to squeeze in lots of modern technology, without spoiling the mock Georgian look of our interiors. What we’ve worked out may be useful to you if you’re refurbishing a house, or a small office. It’s a general rule of the modern world that nobody’s job is actually what you think it is. For example, maybe you think software engineers are busy engineering software? Our very own Luke has taken to referring to his Java-focused colleagues as IDE operators, because much of their work these days involves selecting from a set of contextual menus, rather than actually writing lines of code. When we had electrical work done here at MetaBroadcast towers, I learned that most of an electrician’s job is actually laying cables, or even doing basic metalwork, rather than anything clever involving a choice of fuses, circuits or phases. So what does a network installation person do? We learned quickly that much of their work is analogous to an electrician. They spend time installing trunking, and laying cables. There’s also some highly skilled work to terminate the cables, but that’s a small part of the job. The main difference between electricians and network installation? Network installation is a newer, less regulated and more niche role. That means it’s much more expensive for the same quality of work. But wait. Network installation folk are actually spending most of their time installing trunking and laying cables, not doing the termination work they’re specialist in. You’re paying a premium day rate, for work that would mostly be completed for less money and to a higher quality by someone with good carpentry and decorating skills. To cut a long story short, after some false starts, we worked with a carpenter and decorator, who made subtle cable routes through walls, and laid the cables. We learned how to do the termination and testing ourselves. In an existing building, where a high quality job is required, for every 1 hour terminating and testing cables you’re likely to spend 2 hours laying and labelling the cables, and 8 hours making the cable routes. The latter task involves installing trunking, making holes in walls, sometimes moving existing trunking, and installing the wallboxes or patch panels. Problems are going to arise at this stage, and you need to spend the time to fix them. It’s tempting to start laying cable already, when the routes are not quite right. But if you cut corners, you’ll end up with a bunch of messy bits. Then you’ll fill that space with important cables, which go between the various messy bits, leaving you with a much harder thing to fix up later. Category 5e cable (cat5e) is a wonderful, robust, ubiquitous standard. Cat5e cabling can be used to send phone signals, power for some electronics, and even video, as well as the normal network signals. If you purchase the parts in bulk, they are surprisingly good value. You won’t find these at any normal DIY shop, or even at electrical wholesalers. However, there are many good value retailers on eBay and other online destinations. As per my last post, avoid the high street. You don’t even get any superfluous gold on an overpriced high street cat5e cable, and it’ll be pre-terminated, so really hard to thread between rooms. Rule number one is to buy cable in reels, that are coiled around a solid drum. Don’t consider cable “rolls” with no drum, or cable already cut to length. You’ll be wanting multiples of 5 reels, of identical type and length. These can then be “pulled” in a bundle from a simple cable stand. Sounds like overkill? Nope. If you’re putting in a few runs, you’ll find this as cheap as working with shorter lengths of cable. The difference is between quickly laying cable that works, and an expensive tangle of potentially broken cables. Rule number two is to get a sharpie and some light coloured insulating tape. 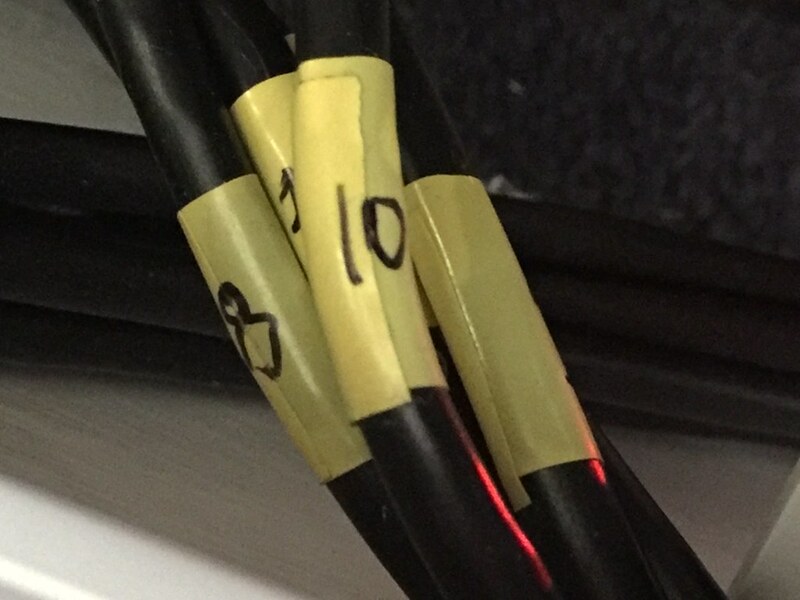 This is how you’ll label your cables, once run. That’ll get you to the specialist termination and testing work. This is the fun bit, and I’ll cover this in the next post. While you can run video signals over cat5e and IP networks, most households still use satellite, cable or an antenna to get their TV. These systems all run over coax, and that means we need coax too! We found the same issues with ariel installations, as with network cables. There’s a blog post on coax coming up, too. node.js, what for and why?